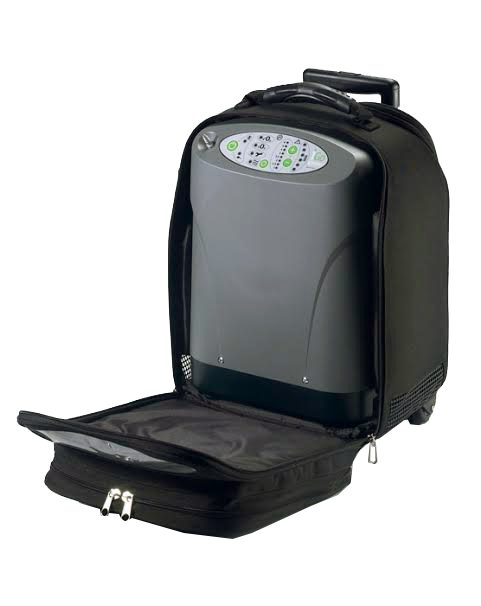 H: 15" x L: 8" x W: 11"
The iGo by DeVilbiss is a portable oxygen concentrator that delivers a pulse flow setting of 1 – 6 and continuous flow settings 1 – 3LPM. These numerous flow settings are packed into a lightweight concentrator that weighs 19lbs with a battery attached. 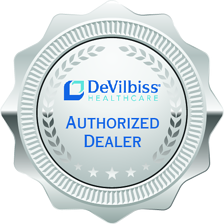 Rest assured no matter if you’re sleeping, eating, exercising, or relaxing the FAA approved DeVilbiss iGo ensures an accurate oxygen delivery! Some of the competition lacks in the battery duration department, however the DeVilbiss iGo packs a hefty punch with its long standing battery life. 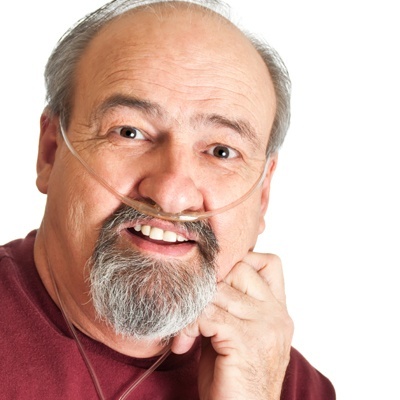 When pulse mode is selected enjoy oxygen therapy for up to 5.4 hours. If continuous flow is being used expect to receive up to 4 hours of operation. Protect your DeVilbiss iGo from bumps and scratches from basic daily operation with the protective case that plays as both a protective shell and a portable traveling cart. 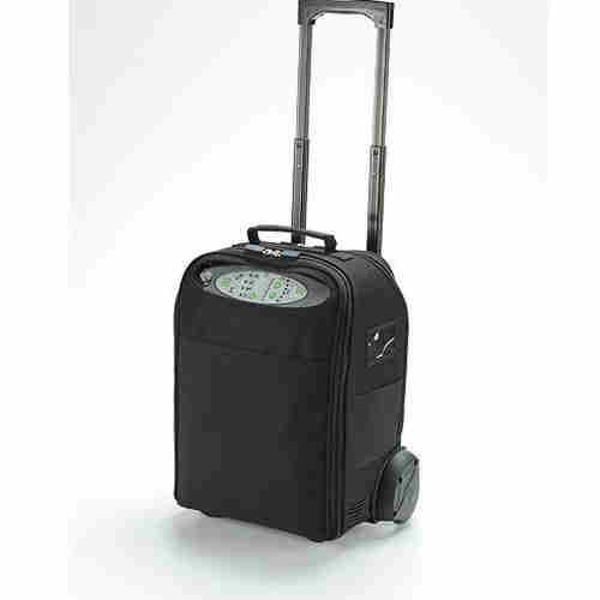 The wheeled protective case is also perfect for traveling, the telescoping handle makes it easy to find the optimal comfort level for you. 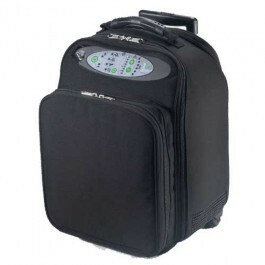 In fact with the inclusion of wheels, the wheeled protective case takes the iGo out of your hands so you can have them readily available for more important tasks. Both the menu and power outlet are easily accessible with the bag. Learning new technology can be difficult and overall frustrating really putting a damper on your day. When you purchase the iGo rest assured that will not be the case when using the on-board control panel. The control was designed to be easily viewed and accessible, even when using the optional traveling case. 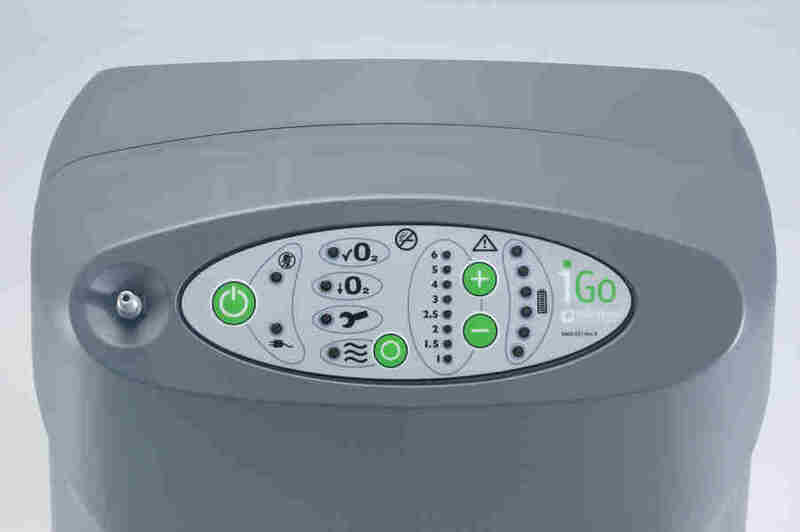 The control panel is comprised of an easily viewable battery status gauge, and flow controls ranging from 1 – 6. [fa icon="quote-left"] Wes was excellent, knowledgeable and efficient! 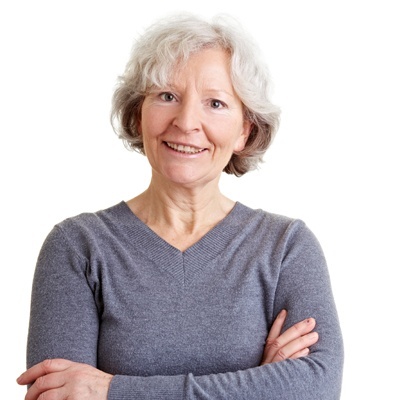 Rest assured that you will always know if you are receiving your prescribed supplemental oxygen amount, if at any point during operation the iGo realizes there is no breath rate an alarm will sound alerting you of the problem. The no breath alarm will sound when using pulse dose flow settings. 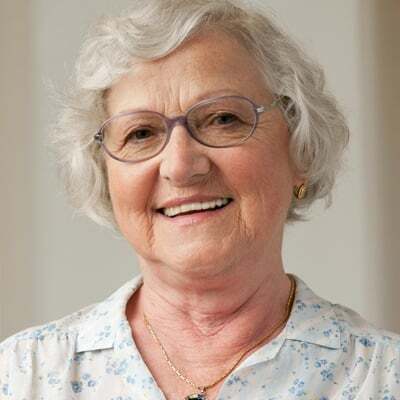 The time it takes to send a portable oxygen concentrator in for repairs means precious time without your highly needed oxygen source. The purchase of the DeVilbiss iGo portable concentrator means farewell to regular professionally scheduled maintenance for 3 years! The only regular maintenance required is replacing the dust filter in the iGo. Easily maneuver or pick up the iGo due to the three handles that are molded into the body of the concentrator. [fa icon="plus-square"] Are you a DeVilbiss iGo authorized dealer? [fa icon="plus-square"] How long does it take for the DeVilbiss iGo battery to recharge? The removable internal battery takes up to 4.5 hours to fully recharge with the AC power supply. While the optional external battery charger takes up to 3 hours to fully recharge one iGo battery. [fa icon="plus-square"] How much does the DeVilbiss iGo weigh? The iGo weighs in at 19 pounds when a battery is installed. 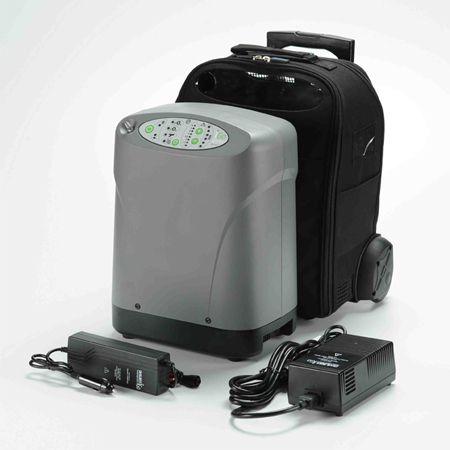 The DeVilbiss iGo is a pulse and continuous flow portable oxygen concentrator. 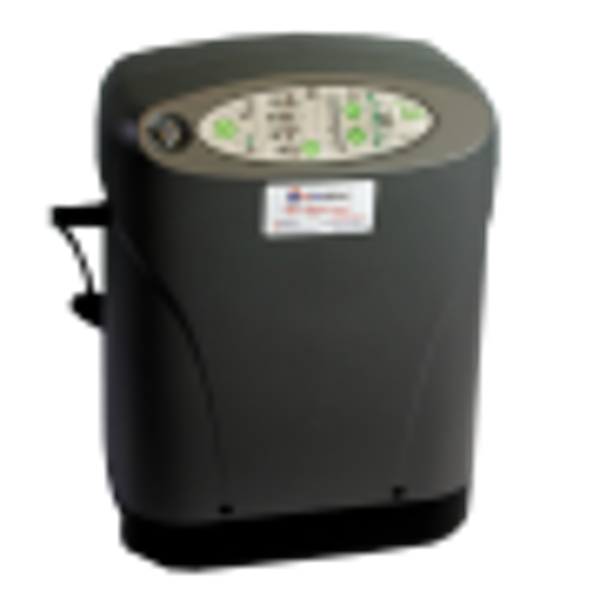 It offers pulse flow settings 1-6 and continuous flow settings of 1-3 LPM. [fa icon="plus-square"] How big is the DeVilbiss iGo? 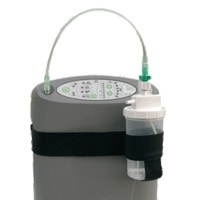 The DeVilbiss iGo measures in at 15” H x 11” W x 8” D.
The iGo has an operating altitude range of 0-13,000 feet. If you go above 13,000 feet the concentrator’s performance may suffer. [fa icon="plus-square"] How long will the iGo battery last? 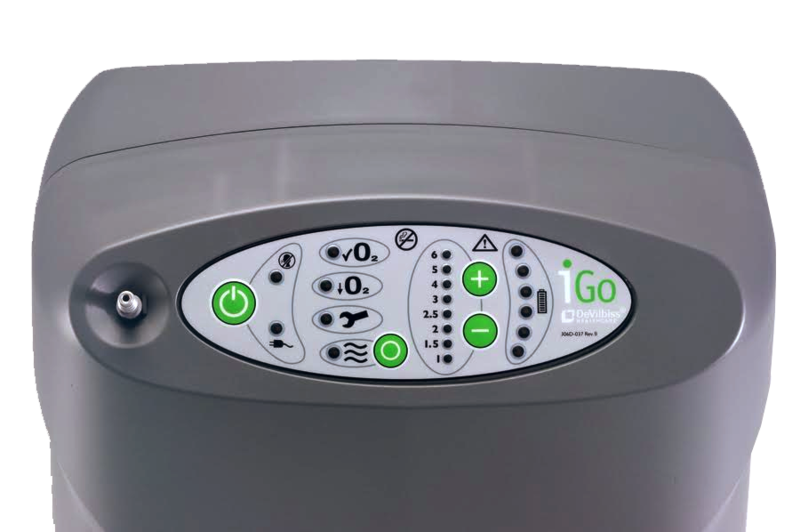 The battery for the iGo by DeVilbiss will last up to 2.4 hours on a continuous setting of 2 and up to 4.7 hours on a pulse setting of 2. [fa icon="plus-square"] Is the DeVilbiss iGo loud and disruptive? When using the DeVilbiss iGo you won't have to worry about being disruptive. Delivering a sound level of 40 decibles, which is quieter than a conversation in your home (50 decibles). [fa icon="plus-square"] What is the best way to recharge my batteries for the DeVilbiss iGo? That depends. If you are at home the AC power supply or additional external battery charger will be the best and fastest options. Especially when you have multiple batteries. However when you are on the go you will use the DC power supply with a 12v outlet or cigarette lighter. This will power and charge your DeVilbiss iGo on all pulse settings, but will only power the iGo on continuous settings. Internal Battery: To recharge your internal battery, you must use the universal power supply. [fa icon="plus-square"] Is the DeVilbiss iGo FAA approved? Absolutley! 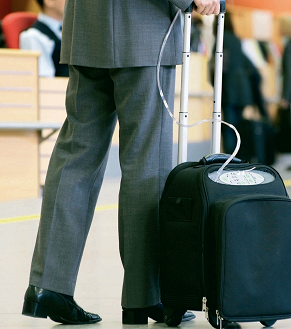 All of our portable oxygen concentrators that we sell are FAA approved for in-flight use.